Anyone who spends any time with me knows that I am very passionate about social media. I am fascinated with how connected our world is, how much we learn from each other, and how readily I have access to high profile people nearly impossible only ten years ago. This power of social media (for me this includes blogs, Twitter, and Facebook) becomes an incredible tool when I use it to further my research, study, and development in (a) the exercise field and (b) leadership and business management. I could literally claim a graduate-level degree in these two areas with the experience I’ve gained since 2006. But for me there is one big hurdle that continually pops up in my weekly social media experience – overload. I’ve previously written about how to decrease the noise and filter out unwanted or unnecessary information on the social networks. But this is still easier said than done, and the landscape is constantly changing. Coach Lecher’s advice rings in my head: “life is a series of adjustments.” Each week there’s a new person to follow on Twitter, there’s a new blog with a ton of useful information, and there’s another friend of Facebook that I want to catch up with. The inputs never stop; in fact they continually grow large. Confession: I am a hoarder. This isn’t a joke – I’m literally confessing to each and every reader of mine that I don’t let things go. My laptop is full of things from years ago, things I will never need again… but I can’t hit delete. My Google Reader is filled with over 60 subscriptions. I’ve “starred” hundreds if not thousands of items to read. I use Instapaper to bookmark articles for reading later. My iPhone now has a “Reader” button so I can bookmark items also to read later. I will never be short of reading material. Enough about my failures – let’s make something happen. What I’ve been trying to show you is that I have numerous inputs in my life. You may have the same problem. It may look a lot different, it may not be as bad, heck it may be worse (I can’t imagine!). But this I know for sure: successful, driven, world-changing people have the ability to manage their inputs and outputs. Sometimes this tandem gets out of balance. That’s where I’m at right now. I’m taking in *so much* information but I’m not producing. I haven’t blogged in over a month. A friend actually asked me if I’m still on Twitter because he hasn’t heard from me in so long. Life has gotten busy, but I still find time to “catch my fix” (read: addiction) to Twitter. The solution is simple. 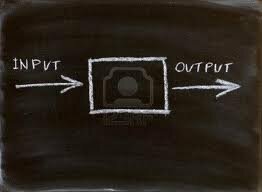 Prioritize the inputs, maximize the outputs. I’m not suggesting an over-compensation shift to the outputs. But I need to do things like this blog post to get my balance back. You cannot build a reputation and a business on your potential. At some point you need to produce. You’re the same way. Maybe at a different level, but ask yourself: What am I consuming, what am I producing? This world is better when we are in balance with what we take from others (in a good way) and what we give to others. Both are essential. I will take this Thanksgiving break and reset. I’ll declare bankruptcy on my to-do list and start over. I’ll release myself from the burden of reading everything that comes my way, I’ll adjust my lists so that the important things don’t get cluttered with the average things. I’ll maximize some relationships. And most importantly I’ll produce and interact rather than consuming everyone’s stuff. This entry was posted in Uncategorized on November 25, 2011 by Hans Schiefelbein.